THE PASSIONATE PRO-LIFER TURNED ABOLITIONIST: Personhood Supporters Mince no Words! Personhood Supporters Mince no Words! DENVER -- When is a person a person, at the point of birth, or the point of conception? Colorado voters may get another chance to decide that issue. 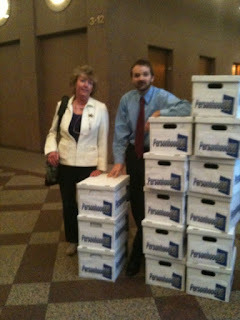 Members of Personhood Colorado turned in nearly 80,000 signatures to the Secretary of State’s office in an effort to get a proposed amendment on to the ballot. They want to outlaw abortion. “This amendment would change the pre-born child’s status from being property, which it currently is in Colorado, to being a human,” said Keith Mason, co-founder of Personhood USA.